Time to line up some new Merge Records 7" series releases. First up on this split we've got Redd Kross. A stalwart on the indie punk scene, and when they put out songs like "Leave It Where You Found It" it's easy to see why. This one is just a smash hit. Over pounding drums and an fuzzy guitar riff, the band lays down some great, borderline British Invasion style vocal melodies. It's probably even better than anything on their last full length "Researching The Blues." One of the highlights of the entire series so far. On the flip side we have a band called Vertical Scratchers. I can't say I've ever heard of them prior to getting this 7", but I am intrigued after listening to their contribution, "Jackie's Favorite." It's a good, upbeat pop song. The guitars have a heavy jangle factor and it's got a really catchy chorus. That being said, the vocals are a little off-putting. Whenever the chorus hits, the singer leaps in to this super high pitched falsetto. We're talking Bee Gees high pitched. I won't go so far to say it ruins the song, but it certainly makes me think twice about looking into any of this band's other releases. 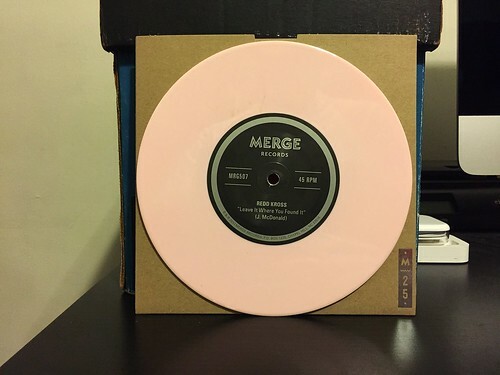 I thought the last couple of singles from Merge were a little lackluster, but this one gets things back on track. I'm still debating on whether or not I liked the Vertical Scratchers song enough to pursue more music by them, but I guess a quick hunt around the internet for some samples won't take up that much time. I couldn't find the Vertical Scratchers song online anywhere, but someone did put the Redd Kross on up on YouTube. Vertical Scratchers takes time to get use to I think. Their full length is interesting but I'm still on the fence about it. I like the energy in the music though so that's why I am on the positive with it. Are the vocals all wacky high pitched like that all the time on the full length too? If you're refering to the whole sort of chorus hall, back up singer type pitch in the singers voice then yes for the most part. I think it is a vocal range he's trying to work with. It doesn't bother me a whole lot but I think that's the issue I have with the music. That sort of lazy like, warbled range of tone in the singing makes me think of Joe Walsh.